Byrne Robotics: Friendliest creator in the industry? Topic: Friendliest creator in the industry? Kind of a strange topic, but many of us either are fans of or work in the comic industry. Who is the hands down friendliest person you have met or collaborated with? Besides JB who is the obvious first choice as the sweetest person in all of comics. Ron Lim comes to mind as just an overall great guy that always interacts and has a smile on his face. Don't know if he is the same while on a project but seems like an overall great guy. Herb Trimpe comes to mind as well. The most intimidating person.....has to be Larry Hama. Not the he isn't friendly, because he is. He just carries himself in a commanding way that makes me pucker up when interacting with him. Walt Simonson followed by Weezie. The absolute sweetest comics creators I have ever met. After he found out my cousin and I were from Tennessee, it was off to the races with them. JB was nothing but great to me the couple of times I met him. (Does it count as a couple if they were in the same weekend?) Gave me a copy of his first issue of WONDER WOMAN one day and a copy of the Alien story the next. Was gracious with questions I’m sure he’d heard 1000 times before and seemed like he really enjoyed being there interacting with the fans. Matt Wagner was really great, too. Tony Isabella is a great guy. I've known him for years, and he seems to always treat his fans well. Terry Austin was a gem as well. When I met him, no one was at his table, so he invited me and the wife to stay and chat. Great guy. But probably the number one friendliest* that I've met has to be George Perez. I don't know if the guy knows how NOT to smile. 'Most always cheerful, upbeat, and willing to chat (time allowing.) An excellent fellow. Honorable mentions: Kurt Busiek, Thom Zahler, Marc Sumerak. I've never met JB in person, so I have to take him out of the running... that leaves the winner and still champion for me: GEORGE PEREZ! George was incredibly friendly, chatty, warm and seemed to love every second of his interaction with his fans. I have to agree with the others and mention George Perez. 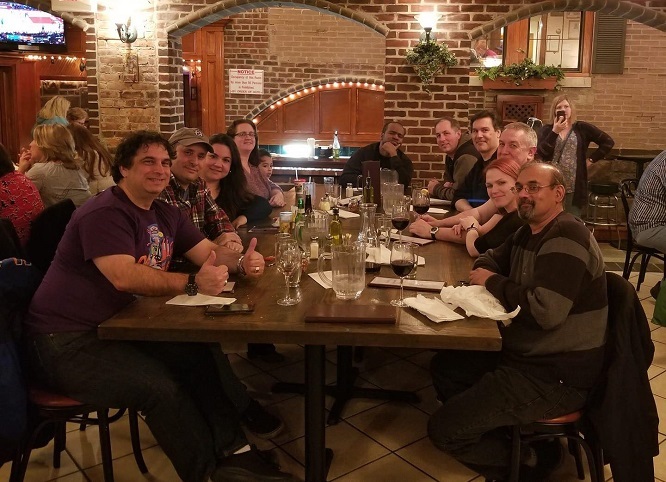 However, there are so many others that are right up there - including Frank Cho, Peter David, Steve Englehart, Amanda Conner, Jimmy Palmiotti and up and comer Dawn McTeigue! In fact, most comic creators that I've met are real sweethearts (including JB). Was running errands with my wife this past Friday and passed the not-yet open Continuity Studios store in Burbank. Was going to miss the 'soft opening' on Saturday night so I thought that I'd take a peek into the store front. Didn't expect to see much but hoped that maybe some nice prints were up on the walls. As I walked up, the door opened and I was invited in. There at the register was Neal Adams! He was very gracious and as nice as could be. He and his family spoke with us for a bit. Unfortunately I was a bit star struck (c'mon it's NEAL ADAMS!) - my wife of course didn't 'get' it (She didn't really see what the big deal was. I explained on the way home but didn't do a very good job)- thankfully, I managed to keep my wits and enjoyed the small talk. Got a nice hearty hand shake too! Afterwards I kicked myself for not asking when DC Universe by Neal Adams Volume 2 is coming out (has to be at least 5 yrs over due). Or asking when the Deadman movie is going to happen. I will put in my vote for Jimmy Palmiotti. I've met George and he was great but Jimmy was just beyond friendly and generous. It's a shame that it was Joe Quesada that became the head of Marvel as I think Palmiotti was the one from that former duo that would've been much better in that role, but maybe he didn't have Quesada's ego and drive. Of the creators I have met in person, George Perez is probably at the top. Nicest I've ever met? Joe Staton. I haven't met too many, but Jon Bogdanove stands out. He was with his brother, turns out they and my dad all went to the same summer camp growing up. Small world! We chatted for a good two hours, really nice guy. Of the few I've met, all have been great, but Mike Grell is right there at the top possibly because he asked me why I wasn't working in the industry when I showed him some old homages to his work. That kind of thing does tend to pump you up a bit. I've met Bob Layton several times always a pleasant experience. I'll add Todd Nauck to the list of previous mentions. I got to talk to George Perez a couple of times. Super-friendly guy. I'll second Bob Layton and Sergio Aragones--met both more than once and really nice and friendly every time. I see Neal Adams twice a year these days and he's always been great to me, but it's always at a con and he's there to sell. I might think it's a bit of a salesman's persona, but the one time I asked him to look at my portfolio, he stopped drawing, stopped selling, ignored everybody else and spent fifteen minutes sharing with me and telling me what I did wrong and did right. That was memorable, nice, and beyond friendly. than John. 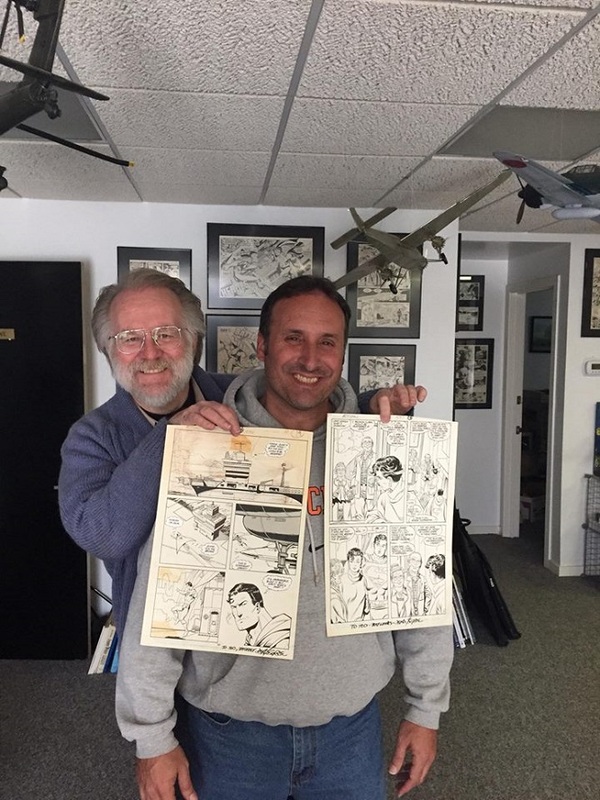 John signed comics for my students too. That's a great picture of John, isn't it? I've been working in comics for about 20 years now, and I've got to say that I've only got a handful of people on my "I hope I never have to talk to that guy again" list--and even a number of those encounters were under extenuating circumstances, like the last day of a long convention. That being said, Ron Lim, Stan Sakai, and Kevin Eastman are three guys who always have a HUGE smile for everyone who sees them at a convention. It's always amazing to watch them interact with fans. That pic is obviously photoshopped. Fandom know John Byrne doesn’t smile. Especially in front of fans. Agreed. He was also the very first creator I met waaaaay back in 1979. I met him again at this year's C2E2... 40 years later. Still extremely nice (as is his wife!). Oh, I forgot to add Jim Steranko to my list, a legend that I never thought I'd be able to meet (which I did in 2017). We were in line for a while, but that's only because he took a lot of time to meet and talk with each of the fans. Also memorable was a moment during his panel, when he decided to call Joe Sinnott on his cell phone so that everyone in the room could sing "Happy Birthday" to Joe. Based on very short con interactions, Jim Starlin, Howard Chaykin, and Frank Miller were also nice and friendly. Chaykin continued talking witth me in the hall after a panel and he was a hoot! At the end of a panel, Miller very kindly drew a kid-friendly Batgirl for a little girl (who probably had no idea who he was).